And the reaction has included fans and others questioning the band’s decision to use Google+, Google’s fledgling social network, for the premiere. They criticized the decision due to the lackluster exposure it would get on Google+ — which then only prompted a few more blog posts and stories. While we applaud the band for hopping the early adopter train, the rather lukewarm Google+ reception shows that the platform isn’t quite ready for primetime when it comes to this kind of promotion. Gumper McGee – Your publicist should be shot. Kyle Cooke – I’m with +Gumper McGee. You don’t post something like this first in Google+ when you have hardly anyone following you. You gotta do some work first getting people to follow you. Considering MMJ is from Louisville, I have a special place in my heart for them — a warm and fuzzy feeling that even beats out my own doubts about Google+ (which you can read about here and here). So I decided to look into this a little more. Was this foray onto Google+ really for naught? In the previously mentioned post, Mashable detailed some of the stats on the pages and video hits from Tuesday. Here are where both sites stood late Wednesday. Facebook is still beating Google+ in this battle, clearly. 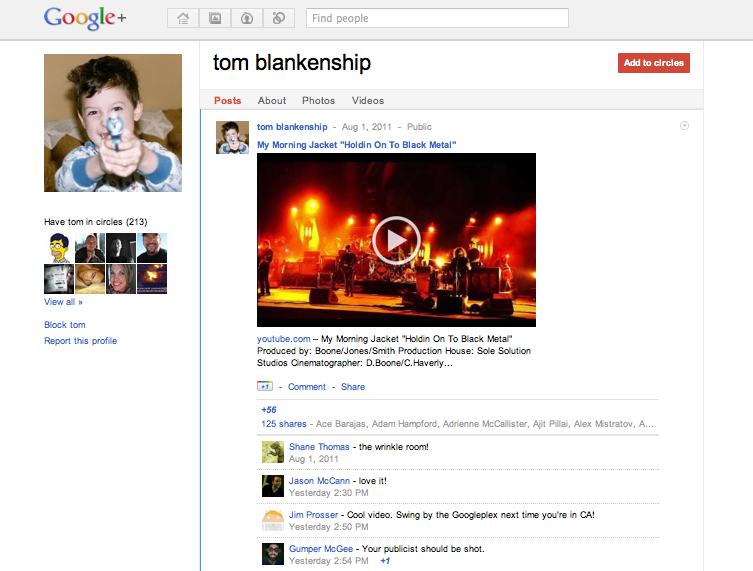 But whether it is because of press mentions of the band members’ Google+ pages or just coincidence — I doubt it — the popularity of Blankenship’s Google+ page and the video posted there has grown extraordinarily. The +1’s grew by almost 1,767 percent. And the people who have circled Blankenship grew by 407 percent, which I suspect was a reason for this whole thing. When social media sites first start, it seems getting famous early adopters to pull other people onto the site with them is key. Twitter à la Ashton Kutcher comes to mind. And these criticisms of lacking exposure clearly got the band, the video and Google+ more exposure than they may have gotten otherwise. As one example, while I like My Morning Jacket, I’m not sure I would have heard about the new video if it wasn’t for Mashable. Still, it’s not like MMJ is hurting for eyeballs. Along with Google+ and Facebook, the band posted the video on its website and YouTube’s homepage to much fanfare. Still, this exercise does highlight how greatly Google+ needs official pages for brands and services in order for it to become a full-on marketing tool for musicians. Get with it, Google. Let MMJ and other groups truly use your site. But until then, rock out to MMJ’s new video below. It’s a dark, trippy, surreal, psychedelic goodie.